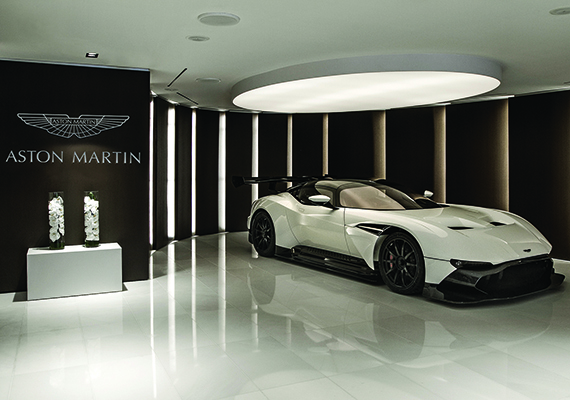 While the James Bond theme song played on the rooftop of the Aston Martin Residences sales center, a $2.5 million Aston Martin Vulcan sat in the lobby of the newly completed building ready to welcome deep-pocketed visitors. G&G Business Developments and Aston Martin opened the multimillion-dollar sales center, at 300 Biscayne Boulevard Way, on Thursday. Sales, which went directly to contract, exceed $100 million, Alicia Cervera Lamadrid said. German Coto, CEO of G&G, expects the 391-unit, 66-story tower to sell out for $1 billion, he told The Real Deal. The developers, who unveiled the project in October and brought Cervera Real Estate on in December, said they’ll break ground on the sail-shaped condo tower in the fall. It’s expected to be completed by 2021. G&G purchased the Vulcan, one of 24 in the world, and will keep it in the three-story sales center. Other features include a custom-made carbon fiber desk, leather door handles and Eames chairs. Aston Martin will have its hands on everything from the leather stitching to “how we design the ramp that goes up to the parking,” Marek Reichman, executive vice president and chief creative officer of Aston Martin, said. The development team declined to provide a buildout cost for the sales center. Buyers so far hail mostly from Latin America and Europe, Coto said. Sales are going well, recognizing how the market is, he added. The project launched during the slowdown in Miami’s luxury condo market. Most projects are reporting slow or stagnant sales. The residences, designed by Revuelta Architecture and Bodas Mian Anger, will be built on the former Epic East site, which fronts the mouth of the Miami River. The developer bought the 1.25-acre site for $125 million in 2014. The Coto family runs the large Coto Supermarkets chain in Argentina, with development projects in Latin America and Europe. They bought the site from developers Ugo Colombo and Diego Lowenstein, who originally planned to build Epic’s second phase. It will be the first residential tower for Aston Martin, and will join such car-branded condos as Porsche Design Tower in South Florida.